To configure your email client for Gmail at IU, follow the appropriate instructions below. iOS 11: Choose Settings > Mail > Accounts & Passwords > Add Account > Google. iOS 10: Choose Settings > Mail > Accounts > Add Account > Google. Older versions of iOS may have a Mail, Contacts, Calendars item instead of Mail, and may not have a separate Accounts. Type your IU email address in the format username@iu.edu; do not use a campus email address such as username@indiana.edu or username@iupui.edu. Tap Next. Type your IU username and passphrase, and tap Login (requires Two-Step Login (Duo)). Select the items you'd like to sync with your device, and tap Save. In your device's settings, choose Add Accounts, then Add account, and then Google. If prompted, enter your phone's PIN, password, or unlock pattern. If prompted, choose whether you'd like your device data automatically backed up, and tap Next. Enter your billing information if desired; alternatively, tap No thanks, and then tap Continue. Outlook for Mac is not currently supported. For security reasons, IMAP access to Gmail at IU is not enabled, and G Suite Sync for Microsoft Outlook is only available for Windows. Open System Preferences. It's normally in the Dock, but is also available from the Apple menu. Click Internet Accounts or Mail, Contacts, Calendars, then Add Account..., and then Google or Gmail. Type your IU email address in the format username@iu.edu; do not use a campus email address such as username@indiana.edu or username@iupui.edu. Click Next. Type your IU username and passphrase, and click Login (requires Two-Step Login (Duo)). Select the items you'd like to sync with your device, and click Done. From the menu icon, select Options, and then Account Settings. Type your name, your IU email address in the format username@xmail.iu.edu, and your IU passphrase. Click Continue. Thunderbird will find and apply Gmail's configuration settings; this may take up to a minute. When that process is finished, click Done. Authenticate to CAS as prompted, and click Login. Click Allow. You cannot add Google at IU Gmail to Outlook for Mac. Instead, use macOS Mail or access it via a web browser. Close Microsoft Outlook, if it's open. Download G Suite Sync for Microsoft Outlook. Run the downloaded googleappssyncsetup.exe file. When prompted, provide the administrative credentials for your computer. If you are using a departmental workstation, contact your IT Pro. When prompted to sign in with your Google account, type your IU email address in the format username@iu.edu; do not use a campus email address such as username@indiana.edu or username@iupui.edu. Click Continue. When asked to choose an account, select your username@iu.edu account. If prompted, type your IU username and passphrase, and click Login (requires Two-Step Login (Duo)). You'll be presented with a list of permissions requested by the Sync app. Click Allow. Click Create profile. 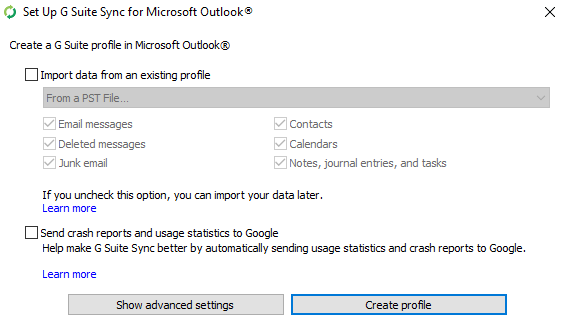 Regardless of your selection in step 8, the tool will create a new Outlook profile for you, and will merge anything from the selected profile into the specified account. When asked to select a profile, choose username@iu.edu - G Suite to view your IU Gmail. This is document apqh in the Knowledge Base. Last modified on 2019-04-04 11:26:35.